How does fire intensity impact plant response? Fire intensity varies with the amount of vegetation to burn, moisture content of the vegetation, and weather conditions at the time of burning. 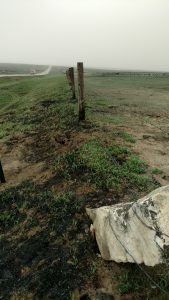 Last year was a good forage production year across most of Kansas, consequently there was plenty of plant material to burn in 2017. The National Weather Service started issuing Red Flag Warnings back in February. A Red Flag Warning indicates good conditions for extreme fire behavior. This usually means relative humidity < 25%, wind speeds > 15 mph with frequent gusts > 25 mph, warm air temperatures e.g. >75oF, and 10-hour dead fuel moisture < 9%. Prescribed burning should not be conducted during a Red Flag Warning. K-State Cattle Feeders College will be May 25, 2017, at the William Carpenter 4-H Building in Scott City, KS, beginning with registration at 4 pm. This year’s program is targeted at cattle crews and will offer in-depth sessions on cattle health, horse nutrition, bits and horsemanship. Bovine Respiratory Disease is the most important health consideration in newly arrived high risk feeder calves. However, there are other conditions that can mimic the clinical signs of BRD. Understanding the subtle differences to properly diagnose can improve treatment and management responses. Feeding the Working Horse, by Dr. Jason Turner, Extension Horse Specialist, New Mexico State University. It can be tough to meet the nutrient demands of working horses. This session will cover how to assess horse condition, feedstuffs and common feeding myths. Bits: How They Work and What Fits You and Your Horse by Gary Wiggins, Wiggins Bits and Spurs, Brewster, KS. When it comes to bits, there are many options. What makes a good bit? How should a bit fit your horse and other topics will be addressed by an award winning bit and spur maker. Preparing Your Horse for the Feedyard, by Todd Adams, Hitch Ranch, Guymon Oklahoma. Getting a new horse ready to come into the yard is something every pen rider faces. Todd Adams, featured in a recent edition of “Western Horseman” magazine will demonstrate tips to safely handle the challenges of working in a feedyard. There is no cost to attend but registration is required by May 19th. To register contact Dr. Justin Waggoner, 620-275-9164, jwaggon@ksu.edu or John Beckman, 620-872-2930, jbeckman@ksu.edu. More information is available at www.southwest.ksu.edu.